Pre Orders: Taken here from 21st September ONE WEEK BEFORE THE OFFICIAL RELEASE DATE. DJ 3000 (UNDERGROUND RESISTANCE / MOTECH) F***ing great record. LEE HOLMAN (XFM DUBLIN) Excellent release! 'Isomer Shift' is just absolutely rocking! All tracks ooze quality! DJ Magazine � TECHNO PAGE - Only Kirk de Giorgio for me - super record. Kirk Degiorgio, the man behind Future Past and As One, continues to innovate with unique sounds and dance floor friendly beats. The Isomer Shift EP is an uncompromising set of progressive dance floor beats in the tradition of Craig/Saunderson and Beltram. The four tracks are outstanding 21st century techno, an instant Degiorgio classic with typically syncopated dance beats, beautiful chords and rhythms that create memorizing and energetic soundscape. On the A side, �Isomer Shift� is a perfect example of Degorigo�s relentless rhythmical talents. Twisted beats, beautiful strings and chords combine to create a master work of futuristic funk. Isidora, the second track brings bigger and spaceier atmospheres to a club fullfiled club beat. The B side takes the future funk even deeper, great strings provide the backing for two tracks that see Degiorgio returning to his previous influences with rhythms and bass lines synonymous with Kirk�s much acclaimed earlier works. 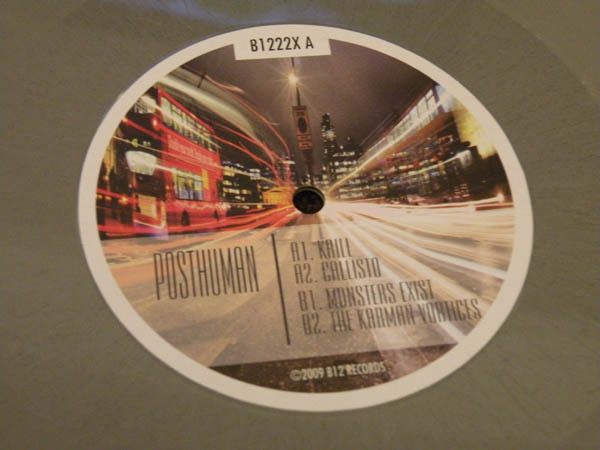 Posthuman�s entry into the electronic music world was via the now legendary Skam Records in the late 90�s. 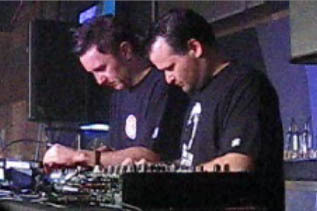 After the duo relocated to London in late 1999 they established their own label, Seed Records which showcased many pioneering acts and became the platform from which Bevan and Doherty released three albums between 2001 and 2006. After leaving the label behind and focusing on their own projects the duo have established themselves as not only Post human but post techno, post minimal and post rave, cumulating in this excellent, creative and diverse four track EP. 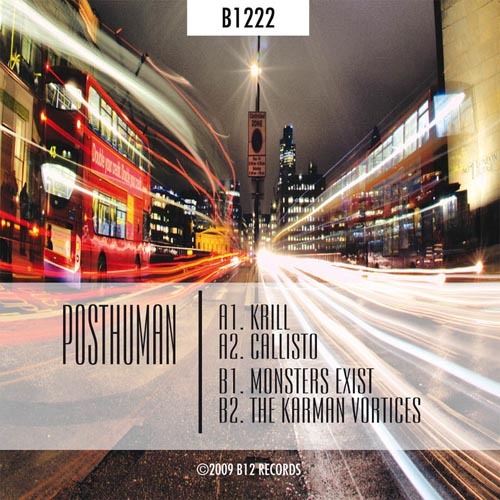 Musically, their sound was unrestricted by genre, "Monsters Exist" and "Callisto" being Posthuman�s take on dark, brooding, complex and emotional Techno, "The Karman Vortices" is a fine example of thoughtful down tempo classy electronic, while "Krill" is aimed straight at the dance floor and is set to become an instant DJ classic. This is classic post techno TECHNO. The epic archive series closes with Volume seven which collects B12 final EP of the 90�s and tracks released on some of the most influential albums and labels of the era. It finishes with the track that launched their return from a decade of hiats, the fittingly titled �Back from the Edge�. 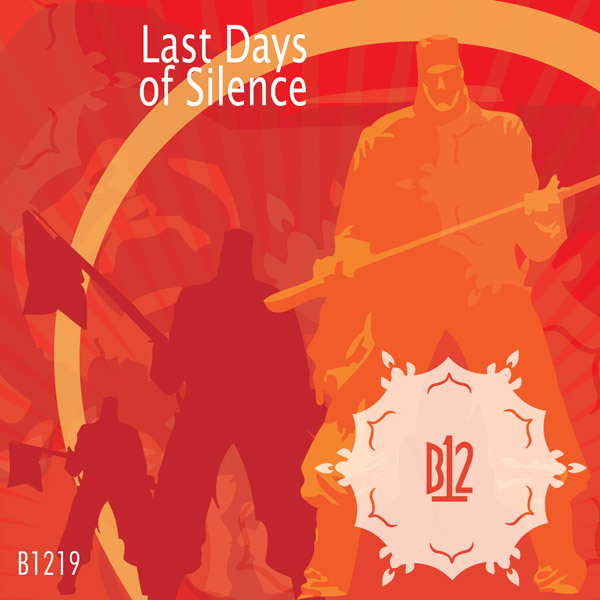 A fitting end that conveys an entire range of moods and emotions that have come be known as the B12 sound and legacy. 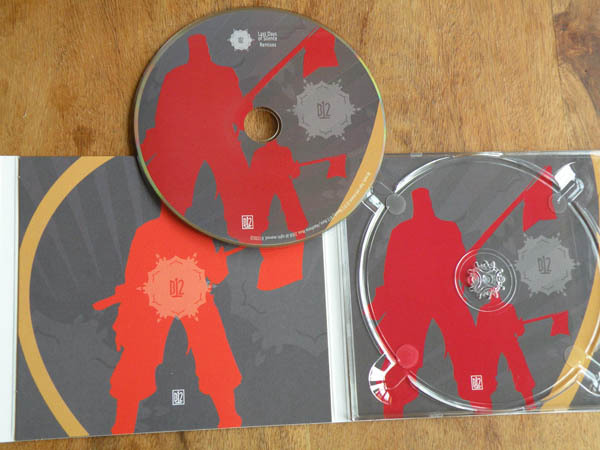 CD1 Collects the legendary �15th� EP from the duo Mike Golding and Steve Rutter under the guise of Redcell. It was after this EP, which was never officially released, that B12 disappeared from the face of Techno for almost a decade. When they fnally returned this EP was finally released on vinyl but collected here in its previously unheard un-edited and remastered version. This EP is accompanied by the amazing soundscape �Seedoiz� which was has not been released before. 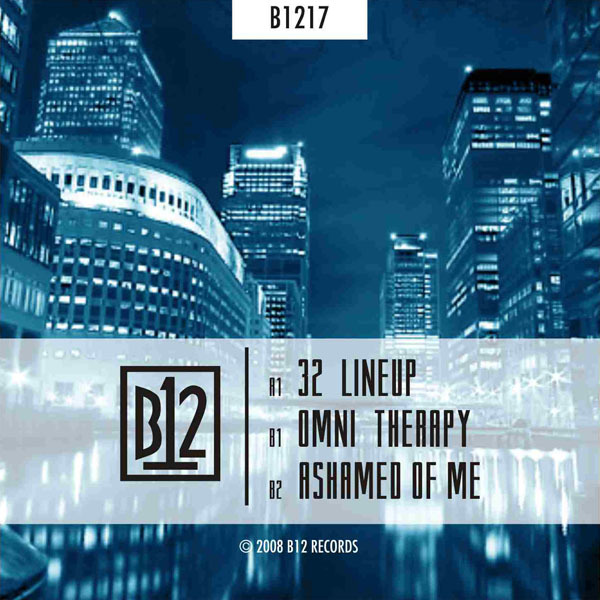 CD2 completes the archive series by compiling the best of B12 tracks that were released on labels other than B12 Records. From seminal albums such as Virtualsex, Time Tourist, Organised, Reflections on Reflections and such labels as A.R.T., Warp, Buzz, New Electronica, Likemind and Seed, this epic series closes with not only a bang but a near nuclear explosion. Archive is released as One Double CD Volume per month for 7 months. Archive Volume 7 will be released on Monday 25th May 2009. For further information please see the discography entry for this release. 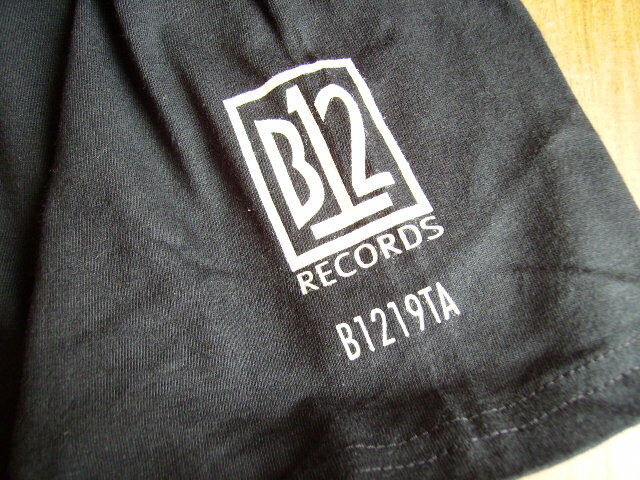 The B12 Records Archive Vol. 7. Archive will be released as One Double CD Volume per month for 7 months. Archive Volume 6 will be released on Monday 27th April 2009. For further information please see the discography entry for this release. 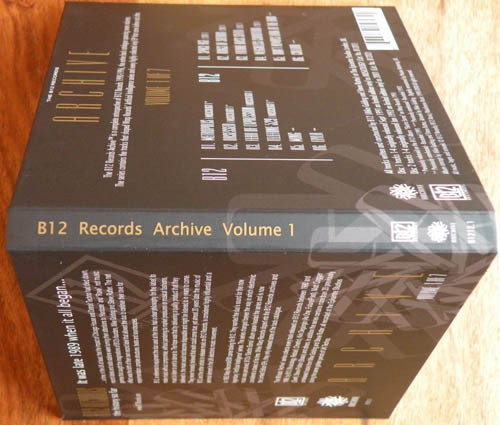 The B12 Records Archive Vol. 6. 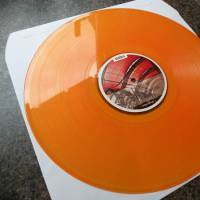 Volume five of this time travelling epic series showcases B12�s (Mike Golding and Steve Ruter) pseudonym Redcell and introduces the first B12 releases from Stasis (Steve Pickton). The double CD set collects two original vinyl EP�s and a limited edition, and rare, CD from 1993, the same year as B12 epic Warp album Electro Soma. These 15 stirring tracks, from what some have called the �Golden Age� of Techno, have a timeless quality that transcends their age, a quality that affords them a vacuum-packed freshness. CD1 Collects the Redcell explorations of Mike Golding and Steve Rutter from 1993 which were only previously released on limited edition vinyl, B1208 and extremely hard to find limited CD release B12CD1. These tracks were extensions of the seminal album Electro Soma, released in the same year, they seamlessly intermingle to create a perfect futuristic soundtrack leaving the listener in no doubt that pure Techno music can be creative, powerful, emotional and danceable at the same time. 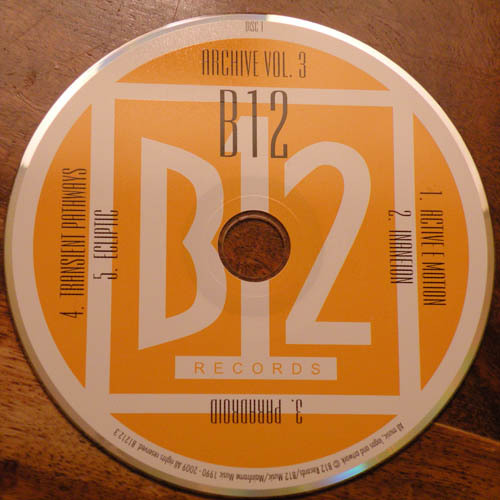 Included on this disc are another two previously unreleased B12 tracks, recorded in 1993. CD2, showcases the B12 Records releases of Stasis (Steve Pickton) and demonstrates that Mike Golding and Steve Rutter are also able to hand pick classic tracks as well as create them. The funk meets Techno inspired music from Stasis shows true innovation and flare which remains unequalled even now. Point of no Return remains a classic of the time, quite possibly one of the techno classics of all time. Archive will be released as One Double CD Volume per month for 7 months. Archive Volume 5 will be released on Monday 30th March 2009. For further information please see the discography entry for this release. 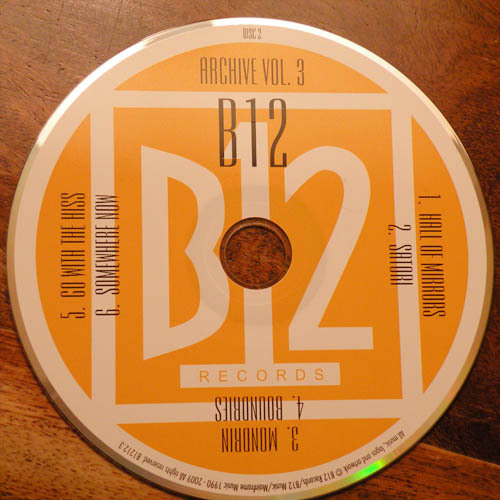 The B12 Records Archive Vol. 5. 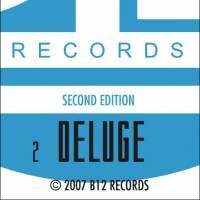 Volume four of this epic series collects three different original vinyl EP�s from B12�s historical label B12 Records. Recording under the names of Redcell and their darker pseudonym Cmetric, B12 paint a picture of distant planets and lost worlds in the more thoughtful side of Techno. These 15 stirring tracks span 4 years from 1992 to 1995 and cover the time between the seminal Warp releases of Electro Soma and Time Tourist. CD1 Collects the Redcell explorations of Mike Golding and Steve Rutter from 1992 and 1995 which were only previously released on limited edition vinyl, B1207 and B1214.2. 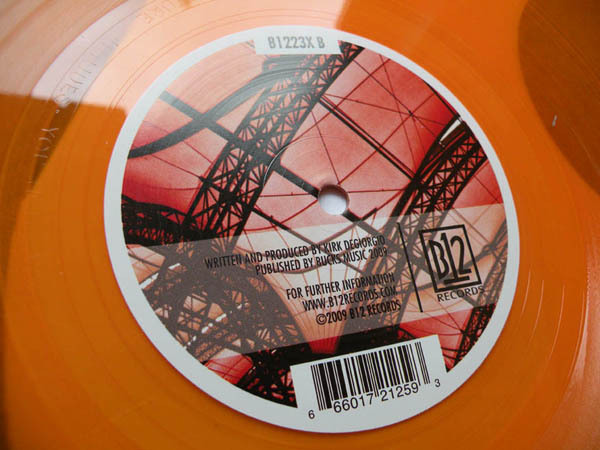 It was the tracks from the 1992, B1207 that first raised the profile of B12 Records, the critically acclaimed EP is said to be responsible for raising the attentions of WARP records which started a relationship which is now legendary. Included on this disc are another two previously unreleased tracks, recorded in 1992. CD2, shows the innovation of B12�s later work. A darker more experimental phase which saw the inclusion of DB5, from B1210, on Time Tourist the duo�s second Warp Album. Included on this disc are another two previously unreleased tracks, recorded in 1994, both are classic deep techno which should not be missed. Archive will be released as One Double CD Volume per month for 7 months. Archive Volume 4 will be released 23rd February 2009. For further information please see the discography entry for this release. 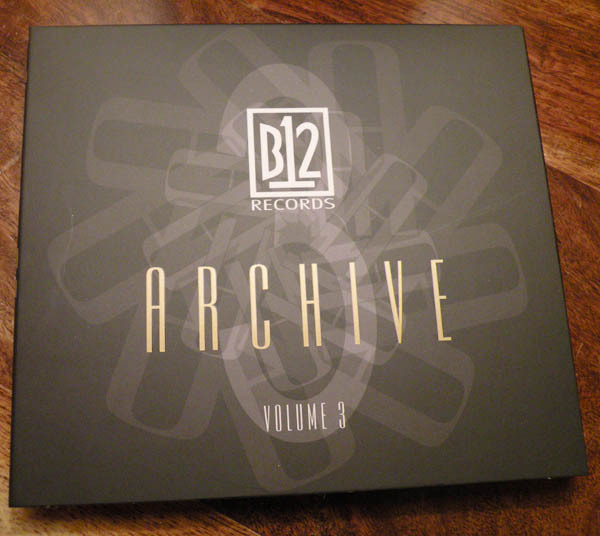 The B12 Records Archive Vol. 4. 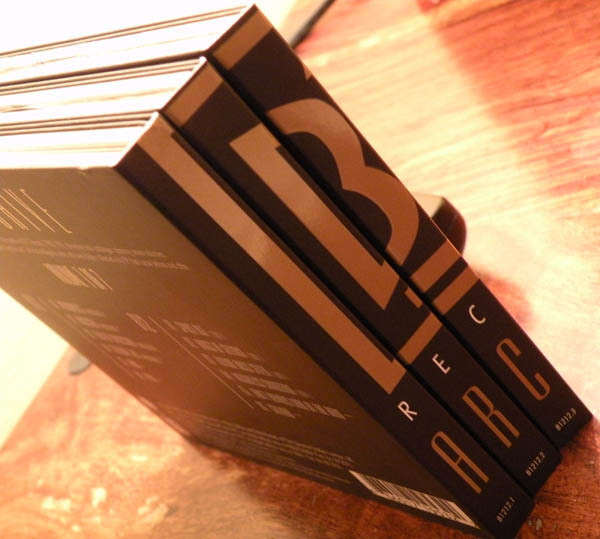 Volume three of this epic series collects the fifth and sixth releases on B12 Records, catalogue, B1205 and B1206. 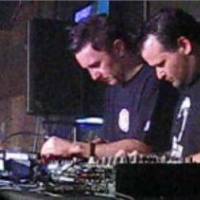 These two EP�s continued the new era in UK Techno, and forged a solid and unforgettable path that ran throughout techno music of the early nineties and has since become the digital signature of the Artificial Intelligence age. 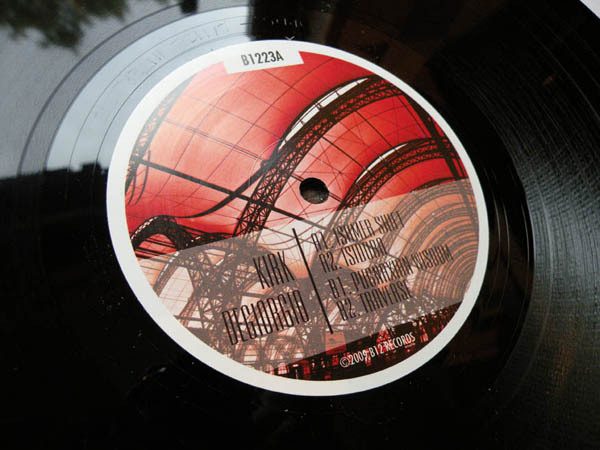 These EPs contained three tracks which were a year later released on the seminal Electro Soma and other tracks such as Paradroid and Inaneon that led the way into minimal techno more than a decade before the genre was recognised. CD1 Collects the techno explorations of Mike Golding and Steve Rutter from early 1992 under the guise of Redcell. These tracks are unique slices of Techno history which are accompanied by two previously unreleased tracks from 1991. CD2, another Redcell incarnation captures the feel of the time with the now undisputed classic, Hall of Mirrors leading the way into a sea of lush synths and beats that have easily stood the test of time. Included on this disc another two previously unreleased tracks, recorded in 1992, these tracks are awesome masterpieces which have finally seen the light of day. Archive will be released as One Double CD Volume per month for 7 months. Archive Volume 3 will be released 26th January 2009. For further information please see the discography entry for this release. 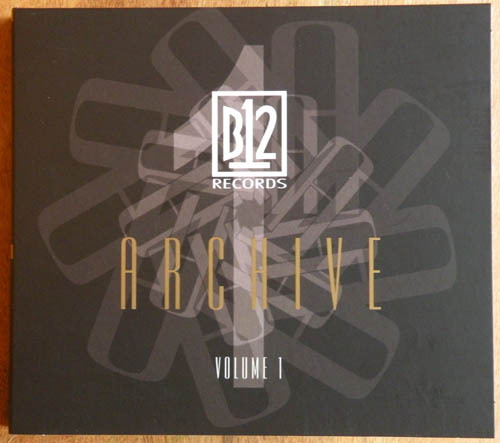 The B12 Records Archive Vol. 3. 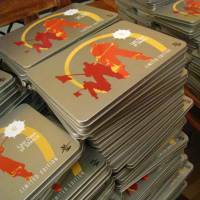 IDJ Magazine As a piece of British Techno history, there�s been very little like it before. Volume two of this epic series collects the third and forth releases on B12 Records, catalogue, B1203 and B1204. These two EP�s continued the new era in UK Techno, truly unique sounds from Mike Golding and Steve Rutter and the first ever material from Kirk Degiorgio and Matt Cogger. CD1 Collects the d�but work from Zee Sharp, Matt Cogger and Future/Past, and As One, a.k.a. Kirk Degiorgio, who is now considered one of the best Techno producers who emerged from this golden UK Techno era. 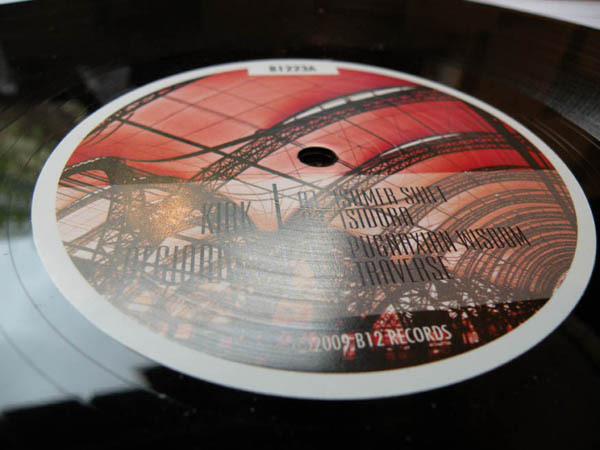 Kirk has subsequently released music, on Planet E, R&S, Likemind, New Electronica, MoWax, Buzz and his own highly influential Applied Rhythmic Technology (ART) and OpART Record labels. 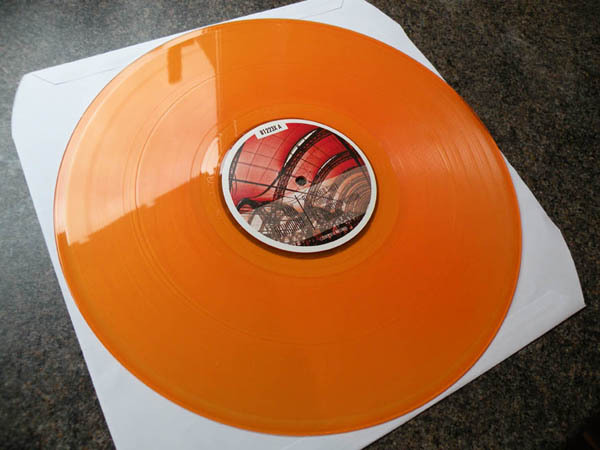 However Kirk�s critically acclaimed B12 Records debut is undisputed as a forerunner in unique sound of British Techno and has been fully remastered from the original master tapes. CD2 Continues the techno explorations of Mike Golding and Steve Rutter, this time under the guise of Musicology, their more upbeat incarnation. It was this EP that first captured the imagination of Warp Records. 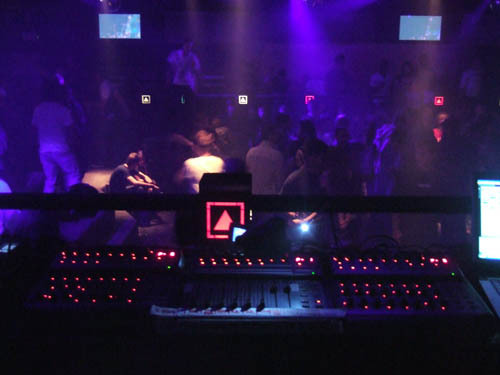 The lead track, Preminition subsequently appeared on the first Artificial Intelligence compilation album that launched the now infamous series of albums. 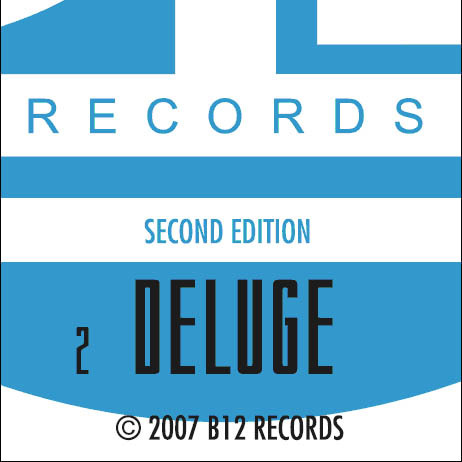 Also included on Volume 2 CD2 are another 2 Bonus Tracks extracted from the B12 Records Archives, also previously unreleased, never heard before on any format. Archive will be released as One Double CD Volume per month for 7 months. 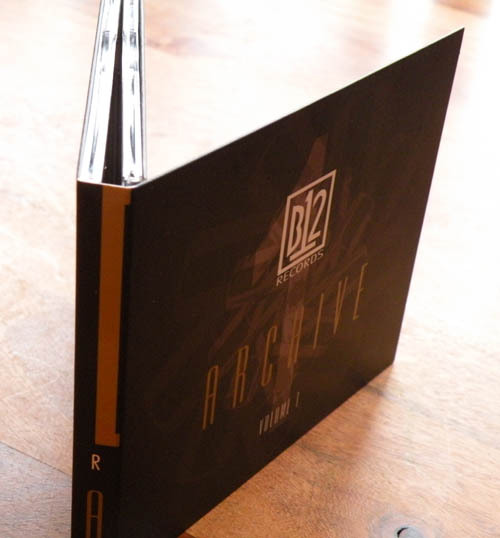 Archive Volume 2 will be released 15th December 2008. More information and track listing will follow shortly. For further information please see the discography entry for this release. 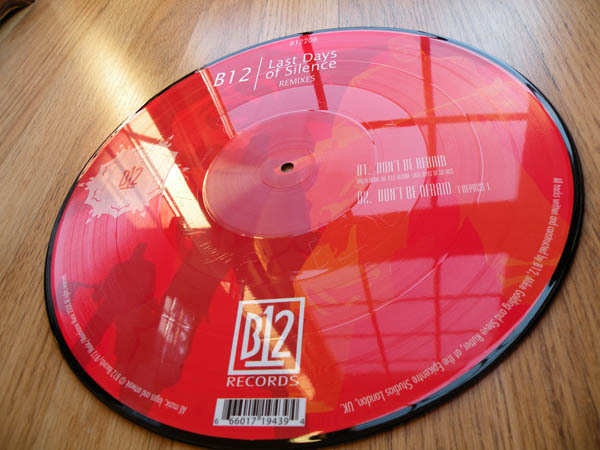 The B12 Records Archive Vol. 2. M8 Magazine The final bonus track "interlopa" is worth the cover price alone. Essential 8/8. For the first time, this 98 track �Archive� series will bring together every ultra rare vinyl EP and Limited CD bonus track, gathered into a series of double CDs. 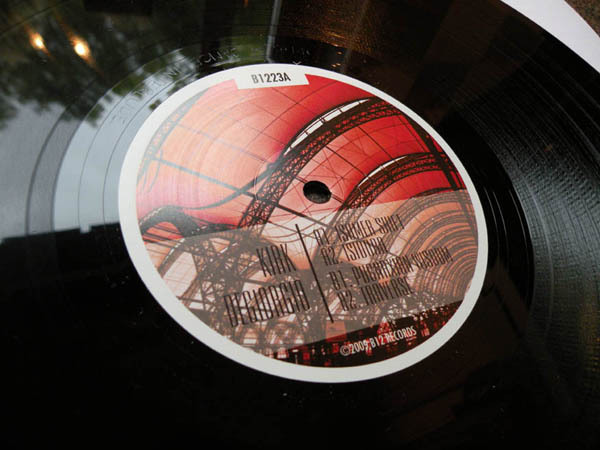 The tracks that shaped techno history have been fully digitally re-mastered, and if owning them is not enough, the series will also contain 27 previously unreleased and unheard bonus tracks, recorded by B12 at the infamous Epicentre Studios almost 20 years ago, during the same golden period of UK techno perfection. 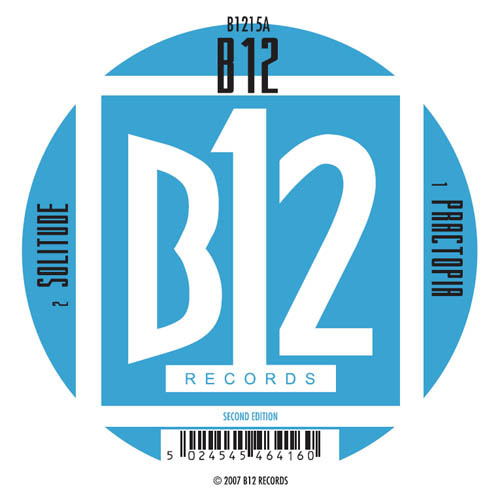 CD 1 combines the first ever B12 release, the first Musicology EP, which includes the seminal �Telefone 529� and �Obsessed� (which were both included on the duo�s Warp album �Electro Soma� released two years later in 1993), with 2 Bonus Tracks extracted from the B12 Archives that have never been heard before. "Ming" and "Eliya" uphold every B12 tradition and maintain an unbelievable quality of sound and texture. Archive will be released as One Double CD Volume per month for 7 months. Archive Volume 1 will be released 17th November 2008. For further information please see the discography entry for this release. 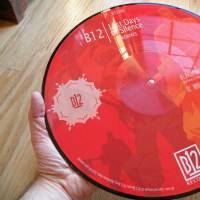 The B12 Records Archive Vol. 1. 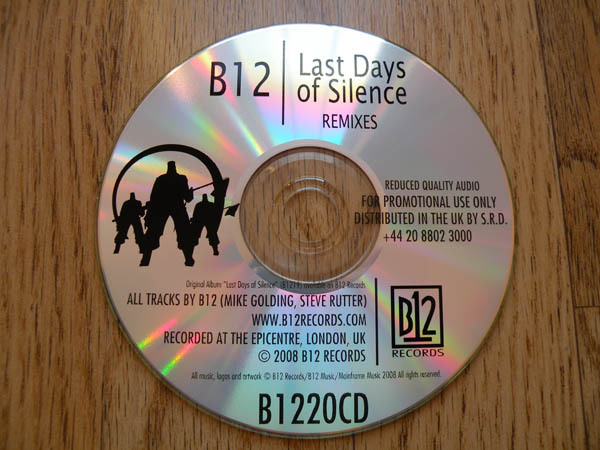 After the critically acclaimed album �Last Days of Silence� projected B12 back into the techno limelight after 12 years of silence, the duo, Mike Golding and Steve Rutter have remixed some of the most asked for tracks from the album and combined them with two completely new and unreleased tracks. The Last Days album built successfully on the ethos set down by B12 in 1990 when they started their own music output on B12 Records, to provide music for listening and dancing. It was described by DJ magazine as �mesmerising Detroit explorations 4.5/5� and by M8 magazine as �epic electronica with a touch of darkness�. The extended CD consists of 8 tracks in total and will be released at the same time as a 4 track picture disc sampler. Both are limited to 900 copies world wide. More details about this release, including samples of the tracks, are available in our discography. This Album is also available as a Limited Edition Picture Disc. 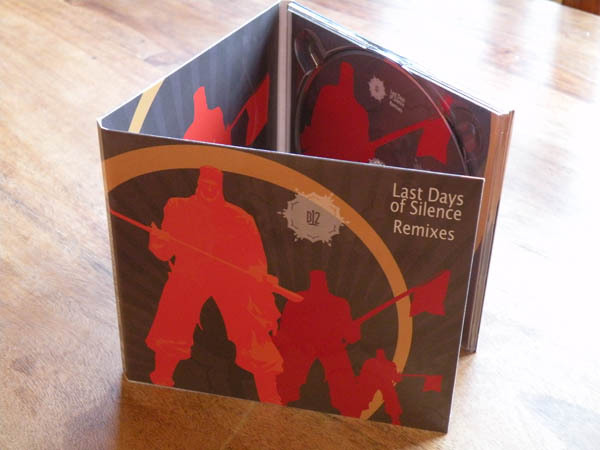 Last Days of Silence - Remixes - Picture Disc. Themilkfactory.co.uk - 4.3/5 Golding and Rutter still can come up with beautiful and emotional charged mini epic electronic pieces. TOMAZ, SILO / SWITCH - STUDIO BRUSSEL Vintage B12. Nuff said. 9/10. DJ Magazine - 4.5/5 Mesmerising Detroit explorations. M8 Magazine - 6/8 Epic electronica with a touch of darkness. 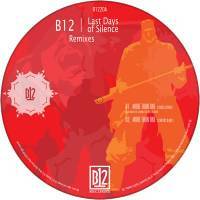 MYSTERIOUS MR O, DETROIT GRAND PUBAHS The B12 Last Days Of Silence Remixes is wicked. Really like it a lot. NICO DE CEGLIA, CODEX / BBC RADIO 1 Cool 8-track CD (4 out of 5). FABRICE LIG Reminds me of some golden years of Warp, experimental end dark! Love it. BOOMKAT.COM Designed as an accompaniment to the fantastic new set from the UK techno legends, this remix pack deserts the dancefloor for a home listening collection of reversioned tracks by Golding and Rutter. This is a dark and sombre affair, in the classic tradition of B12, exploring technofied atmospherics and moods that you simply don't find elsewhere, burning the torch brightly for this particular strain of UK produced techno music that was so heavily influenced by the melancholy and futuristic spirit of Detroit techno. We can safely say that if you're a fan of B12 or the Artificial Intelligence series you'll absolutely love this. 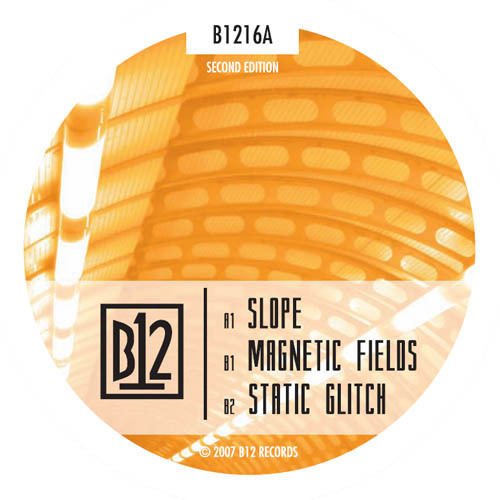 Some 12 years since the classic "Time Tourist" album (Warp), the rightful follow-up to B12�s critically acclaimed and landmark first LP "Electro Soma" (also on Warp) the recently re-launched B12 are back as both label and seminal electronic act. The duo, Mike Golding and Steve Rutter release their first CD album consisting of new unheard material, tracks only ever heard at their live gigs and music only previously available on limited edition vinyl. 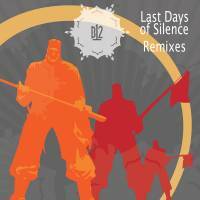 �Last Days of Silence� sees the pair return in superb form with an album that rightly joins their first two highly rated electronic classics. 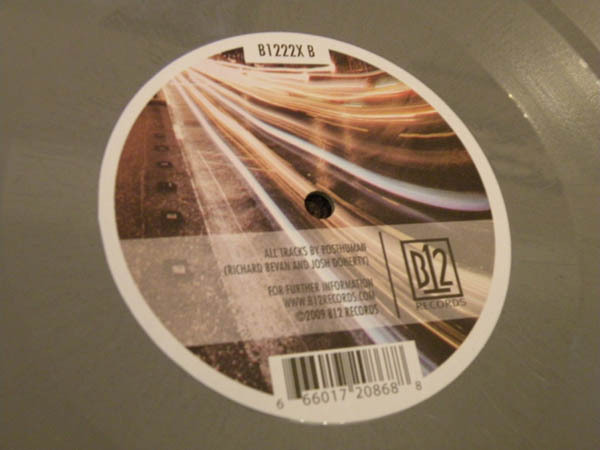 B12 launched their eponymous label back in 1990 and were originally mistaken as hailing from Detroit because their sound fused together so many of the elements that were seeping out of the Motor City. 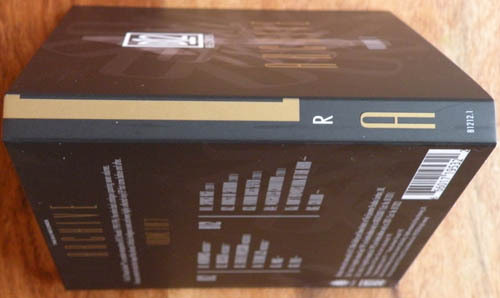 Releasing under a series of monikers, such as Redcell, Cmetric, and Musicology, it was also at this time that they forged their longterm working relationship with Kirk Degiorgio and enjoyed many releases on his A.R.T. label. It wasn�t long before the mighty Warp took notice and the boys went on to release a B12 EP and two albums for the Brit independent. 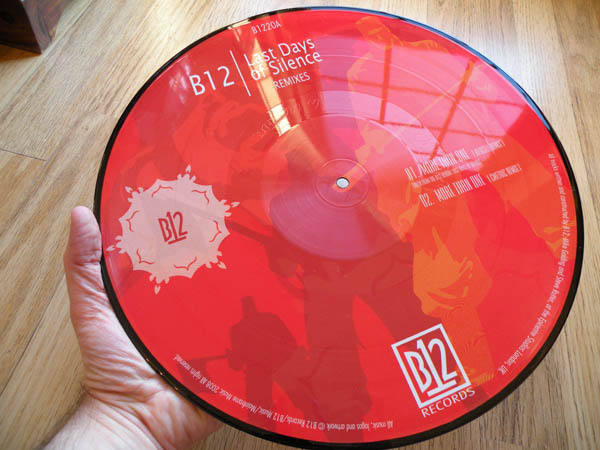 Then in 1996, with test pressings of B1215 in their hands, they disappeared without reason and B1215 never made it to the record store shelves. 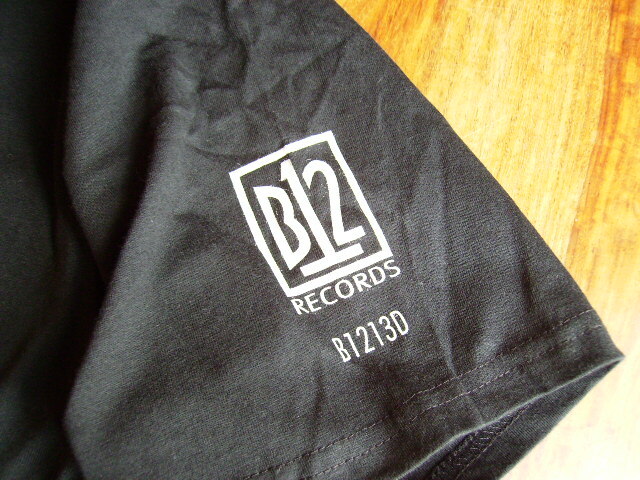 Fast forward to 2005, after a sell out live show in London and upon hearing of the illegal and poor quality bootlegs of their old material doing the rounds, the boys decided to re-hoist the B12 flag and not only promised to re-master those original classics but also return with a host of brand new material. Following recent comeback single "32 Lineup" the new album "Last Days of Silence" builds on the ethos set down by the duo in 1990, when they started their own music output on B12 Records, to provide music for listening and dancing. Both can be heard here with plentiful aplomb bridging perfect atmospheres, melodies and moods with beats and rhythms fitting enough for every forward thinking dance floor on the planet. From the warm and moody "Ashamed of Me" to the far eastern tinged strings on "Hall of Mirrors", echoic deep bass on the break infected "Magnetic Fields" and dancefloor groove of current single "32 Lineup" Steve Rutter and Mike Golding combine the classic B12 sounds into a new vision of the future. 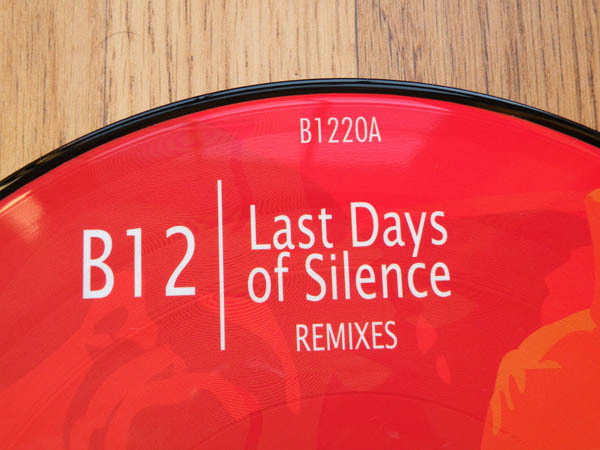 Also featuring a bonus disc of unreleased live recordings "Last Days of Silence" sees B12 rightly return to the UK techno throne. 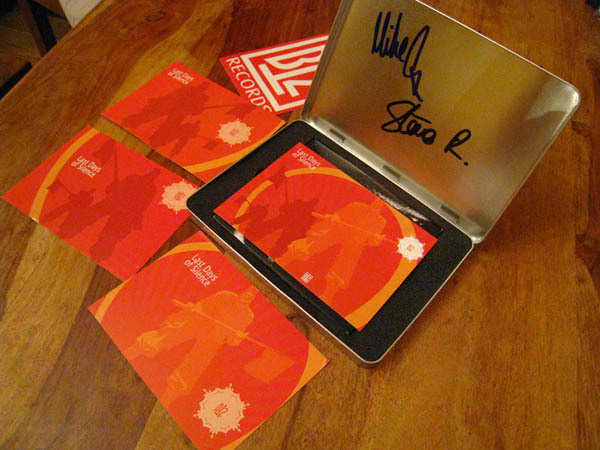 This Album is also available as a Limited Edition in a Metal Tin signed by Mike Golding and Steve Rutter. 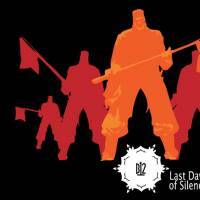 Last Days of Silence - Limited Edition. 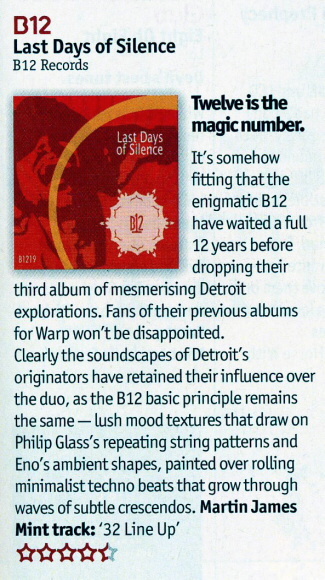 DJ Magazine - 4.5/5Mesmerising Detroit explorations. M8 Magazine - 6/8Epic electronica with a touch of darkness. Electrowerkz Underground Electrics gig coming in 2 weeks (8th Oct 2010). A full ambient set from us, show casing new and old stuff. Join us here. Kirk Degiorgio has spent the majority of his adult life obsessing about music, new and old. From electro tapes to boogie 12"s to Detroit hardware, his collected recorded output reveals a magpie-like obsession with a variety of genres, but always with one common theme: soul. After concentrating on the acoustic soul of his The Beauty Room project for the past few years, he recently reactivated his seminal ART stamp, a label that played a key role in the development of underground UK techno. But there is more... the search goes on. 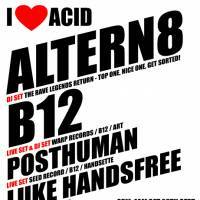 B12 Play alongside Altern8 and Posthuman at I Love Acid on Saturday 26th September 2009. Venue: Ginglick, Shepherds Bush, London, W12 8PH. B12 return to the legendary Norberg festival this summer for a live set to celebrate the festival's 10th anniversary. Norberg festival is Europe's premier festival for electronic music and this year they celebrate it's 10 year anniversary! This year's Norberg festival will take place on July 30, 31 and August 1. 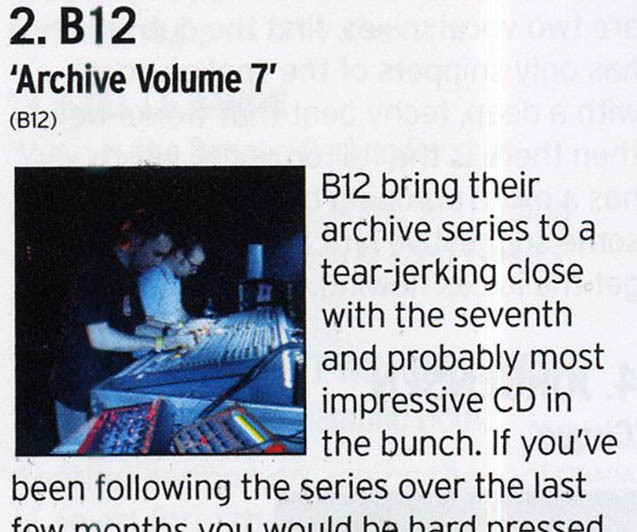 "B12 bring their archive series to a tear-jerking close with the seventh and probably the most impressive CD in the bunch. If you�ve been following the series over the last few months you would be hard pressed to find even one track the didn�t blow your head clean off. 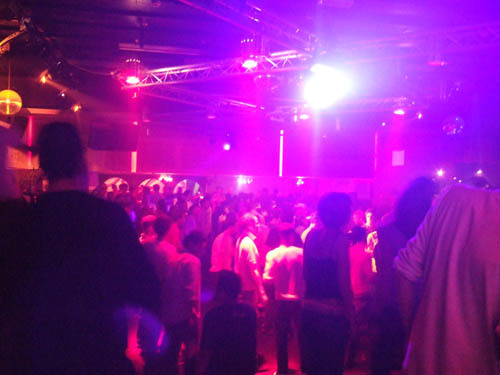 It it�s real emotional techno music you�re after, look no further. There is no one out there like B12; no one comes close � not even slightly. The main concern is that again we�re going to have a huge gap before we hear anything from them again. Let�s hope not. M8/M8"
B12 play live in Glasgow 23rd May 2009, for their first Scottish performance in well over 10 years. "Their rare live events are a combination of tough acid fuelled Techno with the more familiar and deeper Detroit influenced numbers that brought them fame through their own B12 imprint and Warp Records." Performing live tracks from 20 years of techno direct at Bleep at Pivo Pivo, Waterloo St which gives an unusually intimate venue for them to take over for the night- tickets are strictly limited and are expected to sell out fast- available now from Rubadub for a very reasonable �12 + Booking Fee. 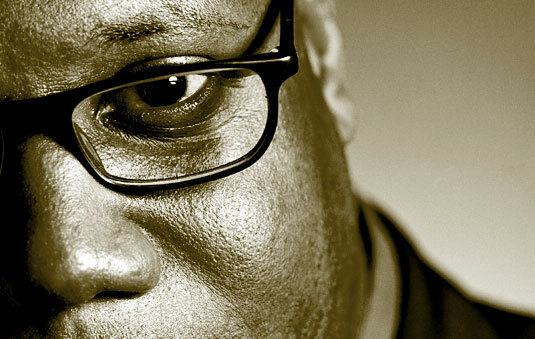 World renowned DJ CARL COX will be presenting a B12 Records label feature that will be broadcast on Thursday 12th February 2009. 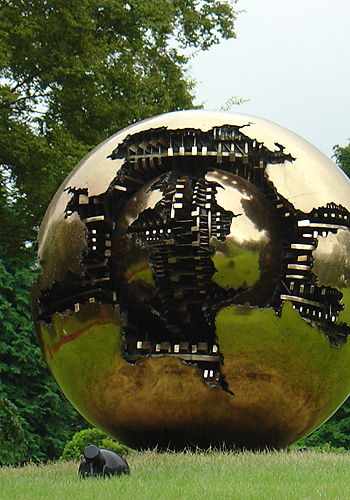 The broadcast will happen simultaneously in 16 countries around the world and live on various internet sites. A full list of the stations and web sites can be found below. This is a very exciting prospect for B12 Records and Techno music in general. So please tune in. Don't miss it. 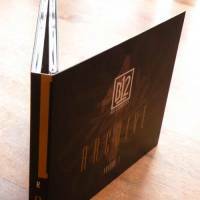 "This is Volume 2 of B12�s epic �Archive� series and is perhaps the most relevant to this page so far, as its direction focuses much more on the dance floor than the previous album. CD1 takes a mixture of former tracks by As One, Future/Past and the incredible Kirk Degiorgio, arranging them in such a way that makes each listen even better than the last. CD2 concentrates on label owners Mike Golding and Steve Rutter themselves under the guise of Musicology. The final bonus track �Interlopa� is worth the cover price alone. Essential. M8/M8." 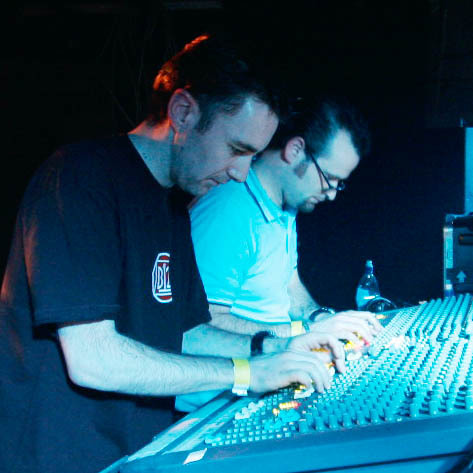 "Acclaimed UK techno pioneers B12 are to make their 17-yearback catalogue available on CD for the first time this month, on no fewer than seven double disc compilations. The B12 duo of Mike Golding and Steve Rutter first rose to prominence in the early 1990s with their groundbreaking releases on Warp�s �Artificial Intelligence� series, which showcased the best intelligent and forward thinking techno from the UK and beyond. Yet the dup had first found underground fame with their B12 Records label, whose early releases were so far-sighted that most Brits assumed they were made in Detroit rather than north London! Many of those original B12 releases now change hands for vast sums of money on eBay and Discogs, so limited were the original vinyl pressings. Now Golding and Rutter have decided to re-release everything the label has ever put out over the last 17 years in an epic project called �The Archive�. That�s98 tracks over seven double CDs, featuring every single track pressed to wax, as well as 27 unreleased gems from the old hard drives and DAT tapes of B12 themselves. 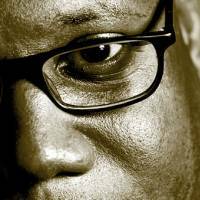 As a piece of British Techno history, there�s been very little like it before. Certainly, if you�re remotely interested in the development of electronic music in the UK, �The Archive� is well worth a gander. �Volume One� should hit stores November." 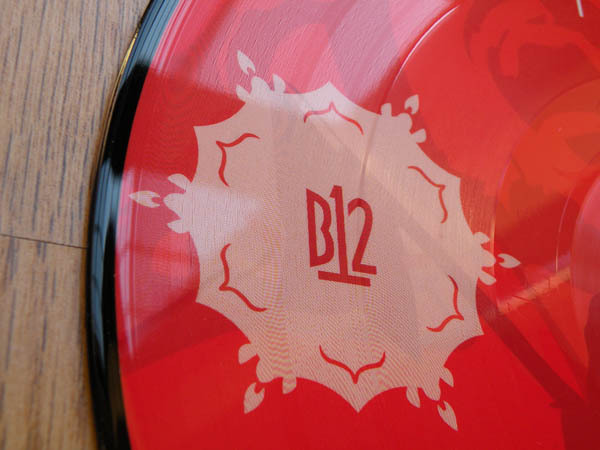 The B1220 Limited Edition Picture Disc has LANDED! and it looks AMAZING!!!! Check out the pictures here, and more in our coming soon section and more on the Discography pages. This release is available on the 20th October 2008, you can pre order here on MONDAY 13th OCTOBER 2008. 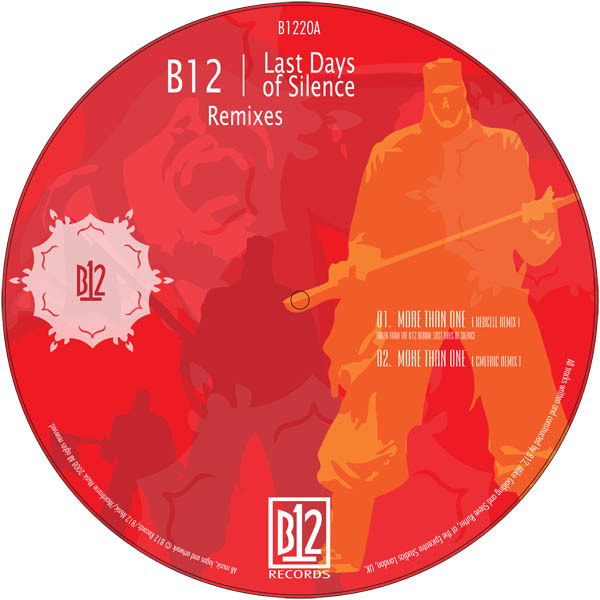 The Picture Disc Vinyl version (pictured) will contain the two most requested tracks from Last Days of Silence, More Than One and Don't Be Afraid in their original Album version and two new exclusive B12 remixes. The CD version will contain two more remixes of tracks from Last Days and two new exclusive tracks that are previously unreleased. 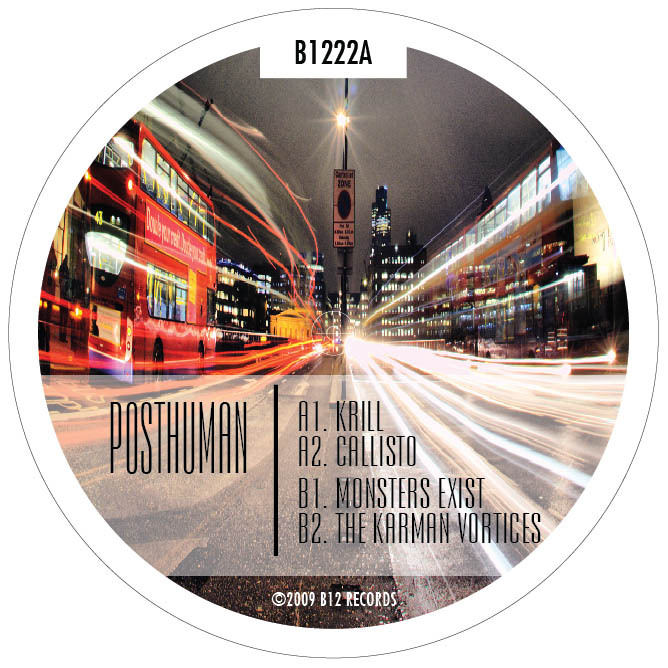 B1220 (Picture Disc) and B1220CD will be available from all good music outlets, and all good download sites including iTunes, Bleep and Beat Port. Contact our distributor SRD UK for retail orders and pre orders. Pre orders will be available from this web site one week before the release date. Release date is set for October 20th 2008. More news coming soon. 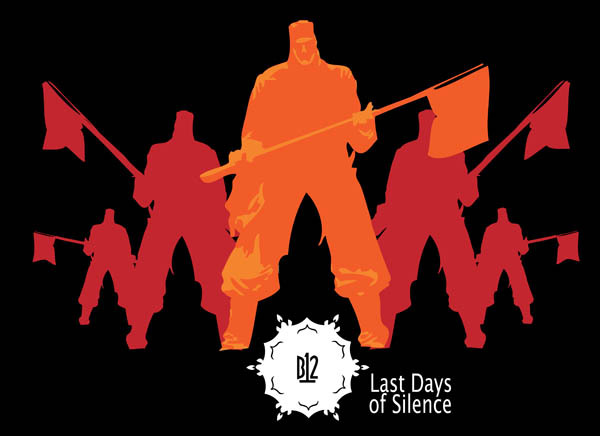 The new B12 and Last Days of Silence t-shirts will be available for pre-order on Monday 19th May along with the Last Days of Silence album Pre-Order. 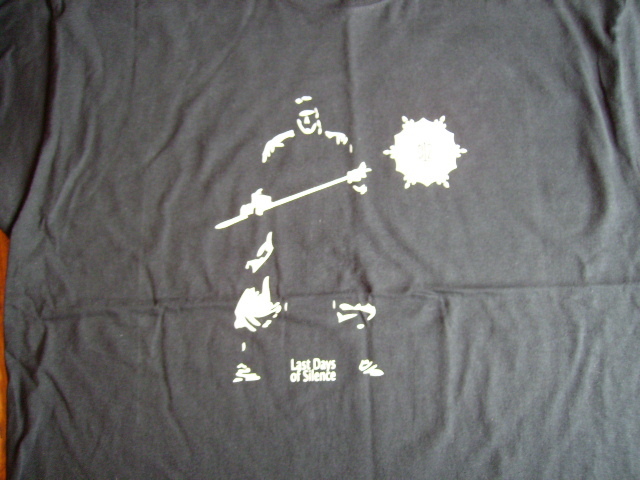 We have a delay with one of the t-shirts so it won't arrive for a few days, but here are pictures of the other two. L (large) 56cm across from armpit to armpit. XL (extra large) 59cm across from armpit to armpit. Please measure your favourite t-shirt flat on the floor from arm pit to armpit in order to know your correct size before ordering. Hopefully this will avid the situation where wrong sizes are ordered. After some waiting time for the actual double CDs to be pressed we can now give a full view of the final Limited Edition product on video. We have worked long and hard to deliver a good product that will be something special in years to come. We have been very choosy about the quality of materials and printing used. We very much hope you like it. 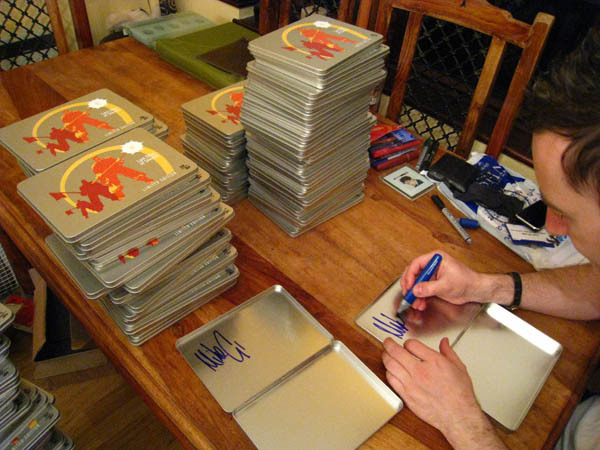 Tonight the Last Days of Silence Limited Edition signing session was completed. 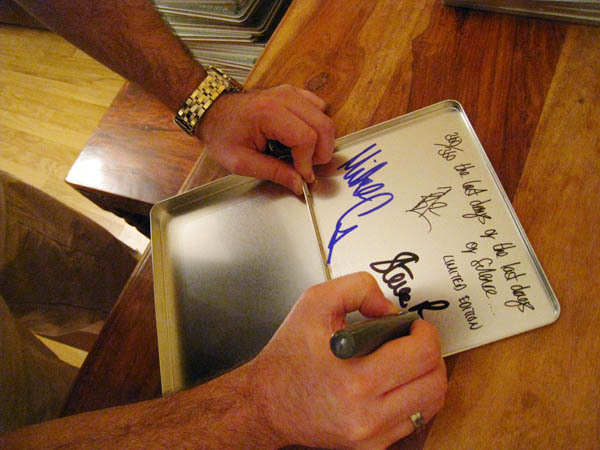 360 Limited Edition metal tins were hand numbered on the outside and then signed on the inside lid by both Mike Golding and Steve Rutter. Some extra special nots were added on numbers 1/360, 303/360 and 360/360 see the photos for more. 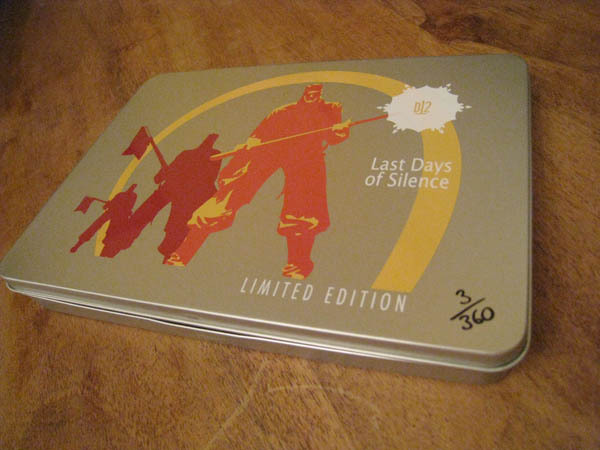 The Limited Edition metal box will come with 2 stickers inside (one Last Days stickers, one B12 Records sticker) and 3 cards with Last Days of Silence artwork. As the release date draws near, more information is being issued here and elsewhere on the net. If you check out our coming soon page you can see a full tracking for the double CD and a taster of the merchandise in the for of T-Shirts. 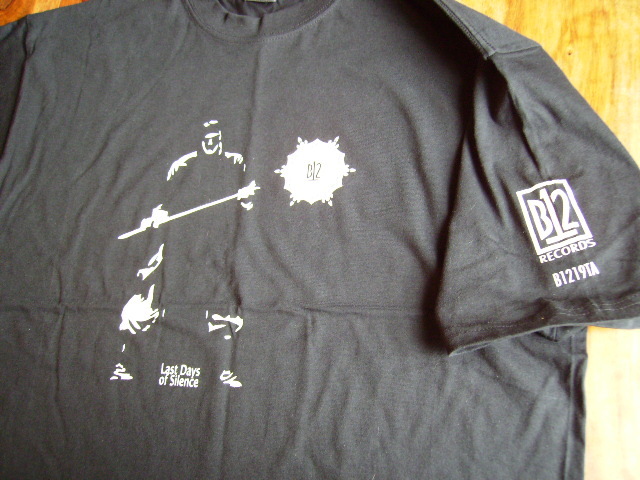 3 t-shirts will be available at the time of release including 2 Last Days of Silence T-Shirts and 1 B12 Records shirt. This merchandise is in addition to the signed and hand numbered limited editino metal tin version fo the Last Days of Silence Album that will contain exclusive artwork prints only available in the limited edition tin and two stickers, one B12 Records and One Last Days of Silence. 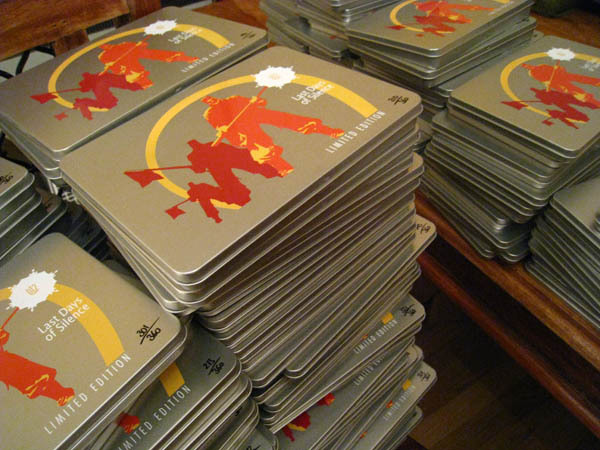 More photos and details on the limited edition tin coming later this week... stay tuned! I can confirm that we have finally cleared the backlog of orders and the last lot goes out in the post tomorrow. A big thank you to Harry for all his help with running the B12 shop and a massive thank you to everyone for buying our music. Firstly, thank you to everybody for their continued support with our latest release(s) B1217. 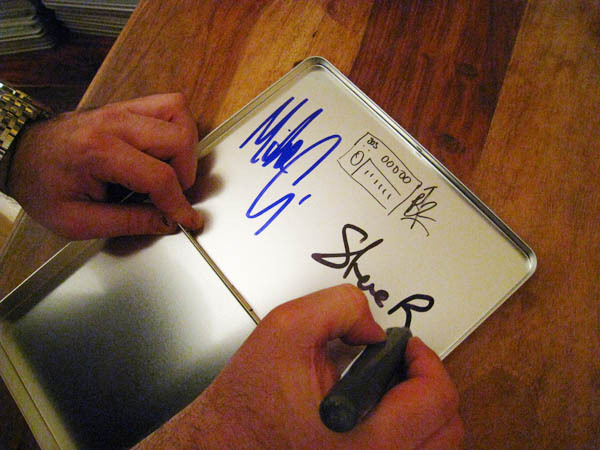 It is very difficult for Me and Steve to make, press, organise and sell our own music. It is exhausting and without continued support it just would not continue. I�m leading up to an apology due to the amazing demand of B1217 which is currently making us run late with processing/shipping orders. So PLEASE bear with us we are working our way through all orders but the sheer volume means it is taking some time. Please don�t be concerned, you WILL get your records but only as fast as we can process them :-). Once again, thanks for supporting our Techno and allowing us and our label to breathe and evolve. 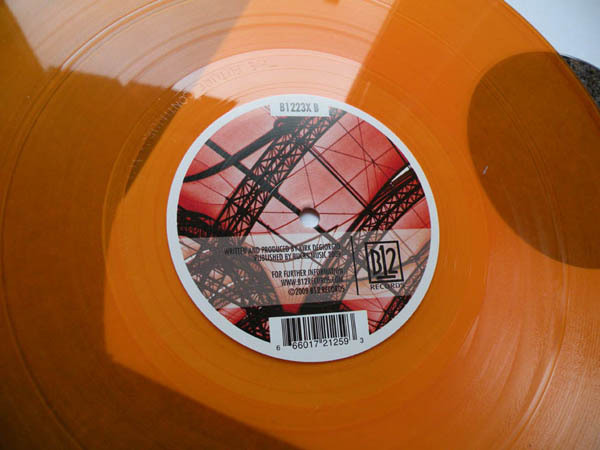 Due to an error at our pressing plant, B1217X (the coloured vinyl edition of B1217) will come in two colours not one. 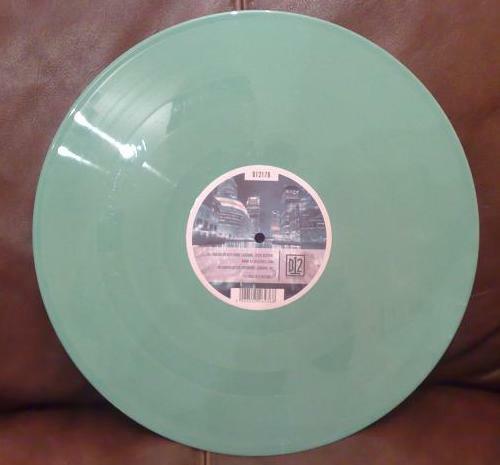 The original GREEN vinyl copies were pressed in error and contain a label with the catalogue number as "B1217" not "B1217X", also the wrong barcode and the year 2007 not 2008. Unfortunately this mistake was not spotted until after shipping, so they were repressed with the correct label (catalogue number, barcode and dated as 2008) but in RED vinyl. Additionally all black vinyl carries the 2007 date. Therefore due to this error there will be GREEN vinyl and RED vinyl available for B1217. Apologies for any confusion this causes. 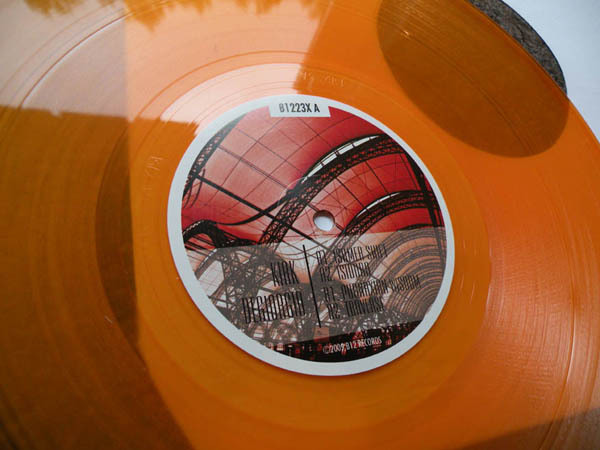 Limited Edition copies of coloured vinyl will be available through the B12 web site. 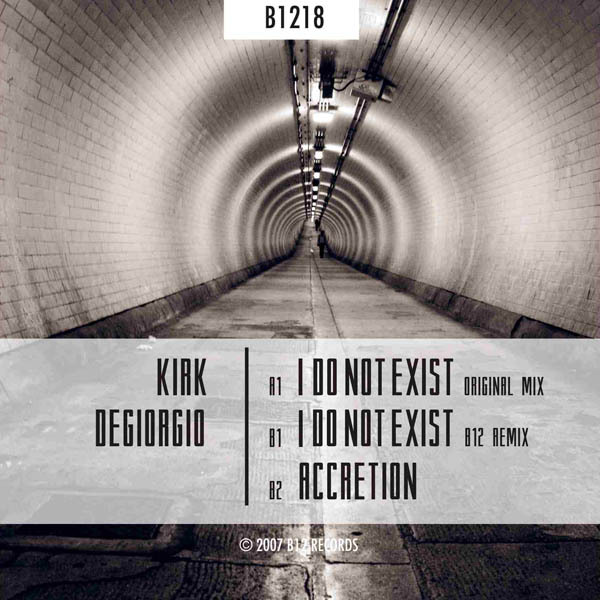 We have revised the release date for Kirk Degiorgio's - I Do Not Exist (B1218). The new release date is one week later than previously advertised. The new release date is the 17th December 2007. We have been busy, in fact still are busy getting a new infrastructure in place to support the future sales of B12 Records. For this release we are using a new distributor (SRD) a new promotion company and are currently working a new and improved B12 Shop to help us sell directly to you over a prolonged period. 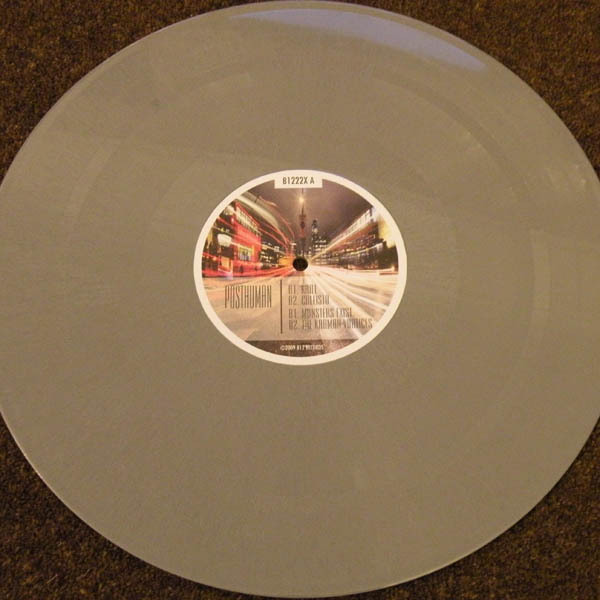 Check the images below for a sneak peak at the label artwork, the black vinyl and limited edition clear vinyl for B1218. 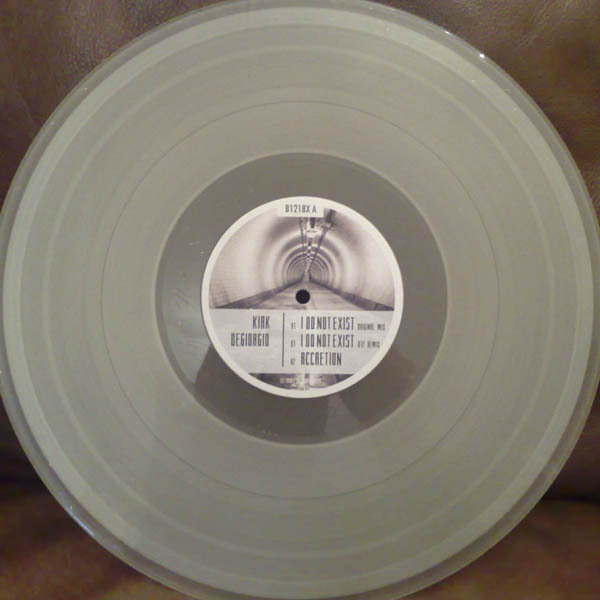 Also note that the limited edition clear vinyl has a separate catalouge number to the black version, B1218 (non limited version) and B1218X (limited edition). More news when our shop will be open for you to buy these new releases will follow shortly. 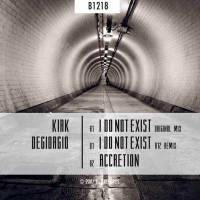 The 17th December 2007 sees Kirk Degiorgio return to B12 Records with an EP of unmissable pure Techno. This release will be available in Black vinyl and limited edition clear vinyl. Thanks to all that came... send any photos of us playing on the night to us and we will post some of them here. 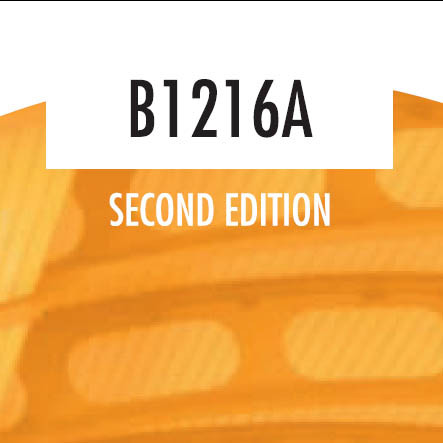 A second edition of B1215 and B1216 will be available from our distributor on the 9th July 2007. 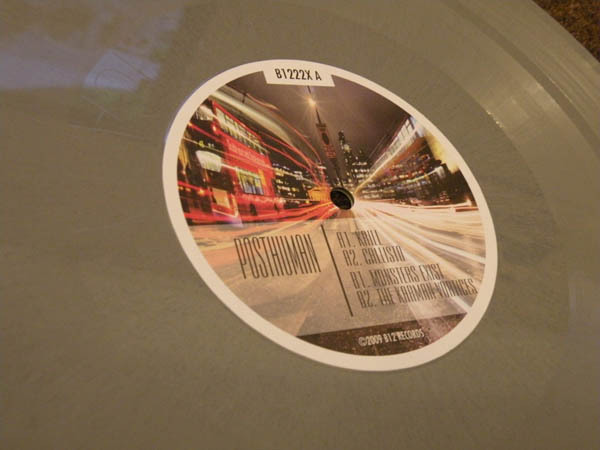 It should be in all good record shops (including the B12 shop) shortly after. The second edition has new label colours, click the images (below left) to see a bigger version. We have not repressed any of the older releases. 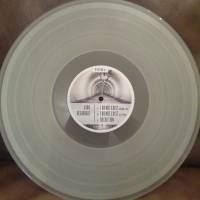 These records are illegal bootlegs, and not mastered from the original plates - they are most likely ripped from CD or mp3, or even recorded from the old vinyl onto CDR. 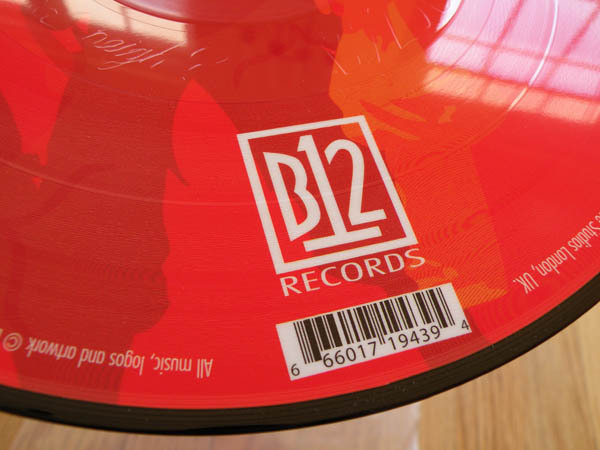 You can check if the vinyl you have is genuine - all B12 releases have messages etched into the run-out grooves. 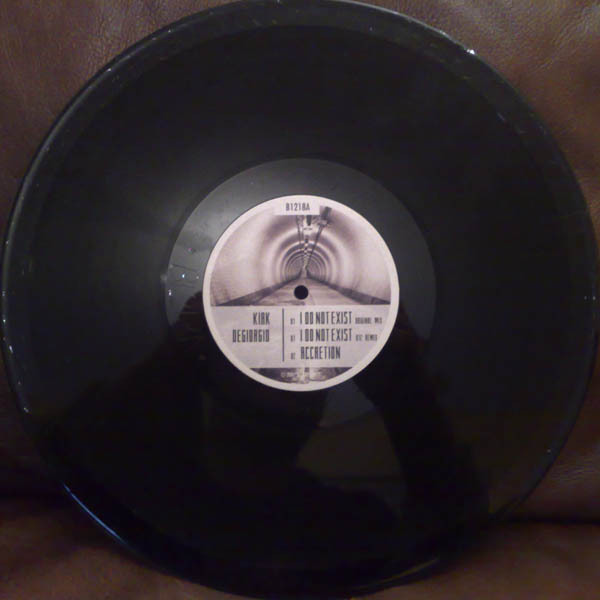 Also, the bootlegs often have a poor quality label print and tinny/trebley sound. There are still some shops shamelessly still buying and selling these, claiming that 'we thought they were real' even though they came from a dodgy bloke who turned up in the shop, rather than from our distributors Rubadub, and also ebay sellers claiming to have the originals - so CHECK BEFORE YOU BUY! If you see any shops selling what they claim to be old stock or 'repressings' - please let us know!!! We will be making the old material available again - the back catalogue has been completely re-mastered, and will be released on a 12 disc CD box set later this year, with bonus remixes and unreleased tracks. So if you're looking for old B12 - please be patient and get the genuine article! Both Mike and I are absolutely stunned by the response we have had to these two releases B1215 and B1216. Our B12 shop sold out in about 5 hours and we thank you very much ! After much debate we have decided that a repress has to happen. The demand is high and we feel that the music should be made available. 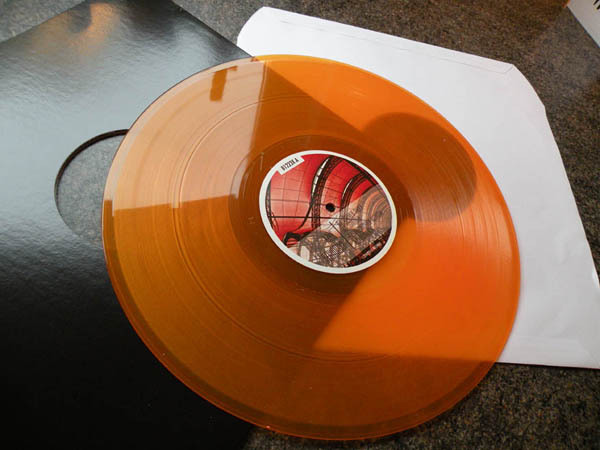 The represses will be on standard black vinyl, have different artwork and will be clearly labelled as 2nd editions. 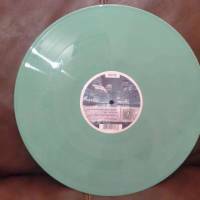 There will be NO repressings of the coloured vinyl. We shall keep you informed as to when these will be available. The official release day is here. 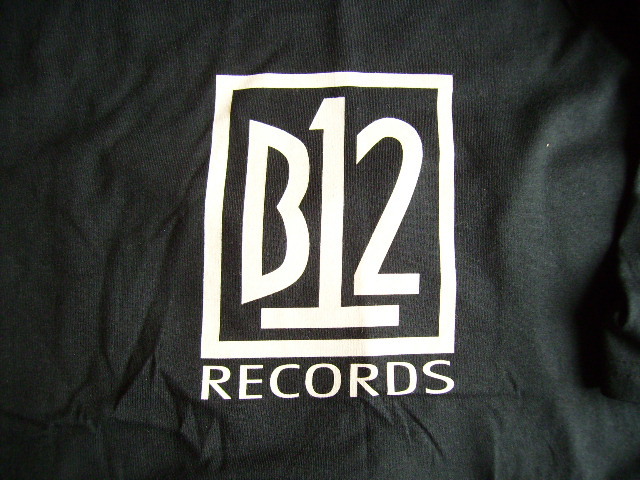 The re-launch of B12 Records has taken huge effort, more than we thought, in reality more effort than it did originally back in 1990 when myself and Steve decided we would start our "record label" when nobody else had any interest and laughed at the idea of releasing the four tracks that made up B1201. We only did it because we loved vinyl and wanted a record with our own music on it. 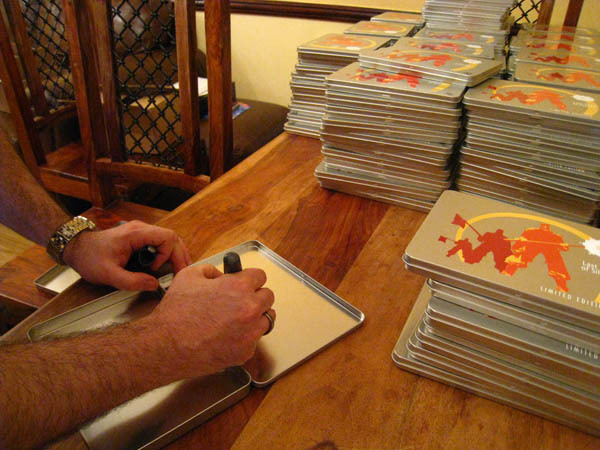 But for us -- as with everything -- attention to detail was very important, this remains true today, so while it would have been easier to accept that "Nobody takes lacquers away and writes on them anymore", we insisted that hand etched vinyl is the only way to continue what we started all those years ago. So, many years on, we find ourselves back in familiar territory, releasing our own music on our own label, only this time we said we would do it "properly". I am not sure either me or Steve really knows what that means, to be honest all we want to do right now is make new music, but we realise the only way we can make our music is to have control over it ourselves because we started this whole creative process all of those years ago to make music for us, by our own rules and not by somebody else?s. Thank you to everyone for their continued support, we are honoured and humbled by it every day. Thank you, we hope you enjoy the music. It's been nearly ten years. We're back. Did you miss us? Have a look around the new site, updates and more downloads will be added over the coming weeks and months. Orders are limited to 3 copies per catalogue number, hopefully this gives the genuine collectors a better change to own copies. Postage and Packing (e.g. "shipping") All shipping is now based on weight and value. All orders over 45 UK Pounds MUST now be signed for which adds a small amount to the shipping total but it is safer for you. Packing will always be good, for vinyl this includes a good quality record sleeve, a stiffener to stop bending during transit. Only 2 postage "runs" will be done each week during PEAK times, such as new releases dates, this means one mid week run and one weekend run. For orders of 7 or more vinyl at one time, postage costs are subject to change (as they will need to be boxed instead of sent in mailers) please get in touch with any questions about this. Be ASSURED this mailing list is ONLY for genuine information relating to �B12 Records� it�s releases and events relating to the label or the artists appearing on it. We will NOT send any emails not related to B12 Records nor will we share your mailing address with ANYBODY else under any circumstances. You will not receive spam from us and "unsubscribe" requests will always be honoured. Please subscribe with confidence. 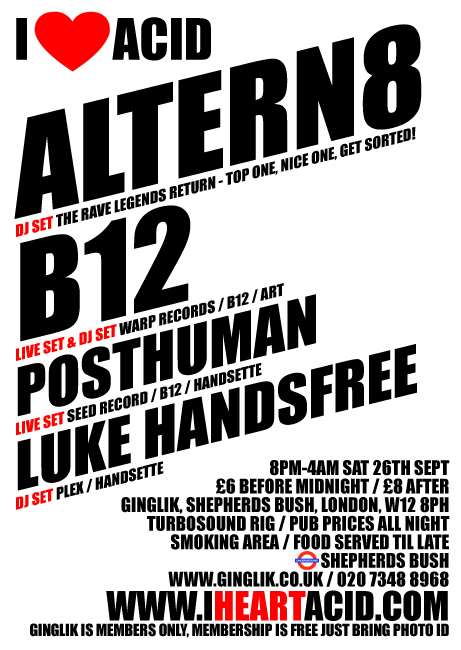 "A retrospective set of London's B12 Records. We've been wanting to do this show for many years, and decided no better time in space than now: "Expressions of the Future" as viewed in 1991 from B12 in London, through a lens that built on Detroit's original foundation, but angled the sound into a unique British unknown. Michael Golding & Steve Rutter crafted this vision under numerous artist names on their B12 imprint, releasing one of the pillars of the Artificial Intelligence era, Electro Soma (primarily a collection of their early 12"s), on Warp Records. 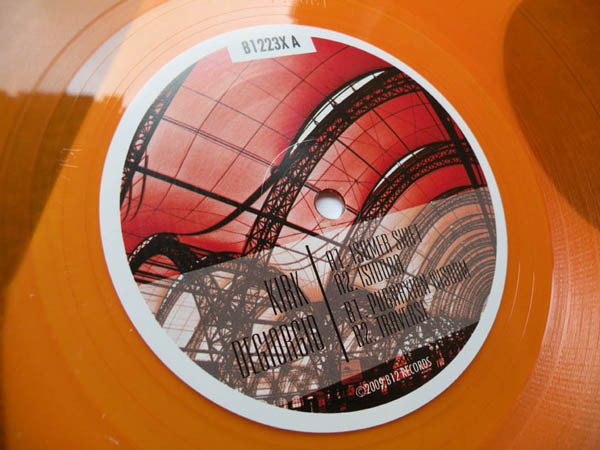 We love the 12" philosophy they adopted, with super-limited coloured vinyl among an already-limited total pressing. The records have gorgeous cutting jobs with massive etchings before and after the grooves, not unlike the look of UR/Red Planet records from that same era. 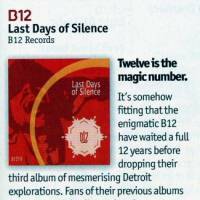 B12 was a key first step for UK's clinical twist on soulful circuitry, we dug deep to play many of their originals we had." After a decade hidden away, B12 have returned. 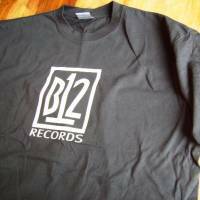 B12 Records was founded in 1990 by Mike Golding and Steve Rutter as a vehicle for themselves and other like minded individuals to release electronic music for listening and dancing. Many thought the duo hailed from Detroit, as their sound fused many of the elements of techno coming from the Motor City, alongside labels such as Transmat and Plus 8. Every record was hand-engraved in the run out grooves, with cryptic clues and messages, recurring themes of futurism and science fiction. Releasing under a series of monikers, such as Redcell, Cmetric, and Musicology, their connections with Kirk DeGeorgio?s A.R.T. Records are well documented, each artist featuring on the others label, and even a pair of split 12?s with a label taking each side of the vinyl. The pair were also snapped up by Warp Records, featuring on the seminal Artificial Intelligence series and releasing two albums and an EP on Warp under the umbrella name ?B12? Then in 1996, with test pressings of B1215 in their hands, they disappeared without warning or reason. B1215 never made it to release. Forward to 2005. 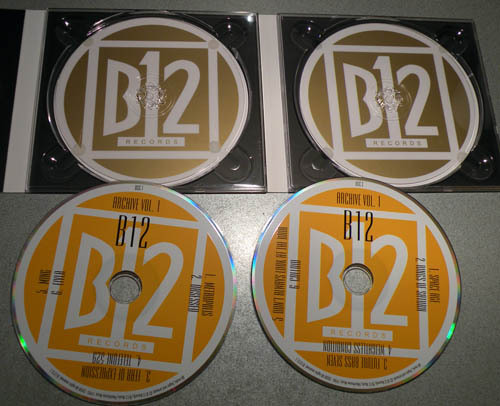 Illegal bootlegs of old B12 material are circulating ? poor quality, without the engravings in the run-out grooves. Mike & Steve return to play a live show in London to a sell-out crowd (the bouncers had to stop queues inside the building). B12 absolutely blew everyone away, a decade away hadn't dampened their sound one bit. The applause at the end was so overwhelming that the following act was shouting at the crowd to shut up and stop cheering so he could begin his set. They announced there was new material to come, and their intentions of re-mastering the back catalogue for release on a 12 CD box set, with bonus unreleased materials. Now, in 2007, B12 Records has exactly the same goal it did in 1990, to provide quality electronic music for futuristic feet and forward thinking minds. All photographs are by Mike Golding. All images are subject to US and international copyright laws and are the sole property of Mike Golding ? 2003-07. No photograph may be reproduced, downloaded, copied, stored, manipulated, or used in whole or in part of a derivative work, without the written permission of Mike Golding. All rights reserved. The B12 Records web site is the property of B12 Records and Mainframe Music ? 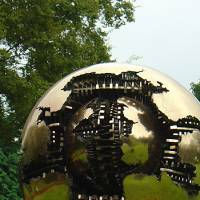 2003-07 and is subject to US and international copyright laws. No part may be reproduced, copied, stored, manipulated, or used whole or in part of a derivative work, without the written permission of B12 Records. All rights reserved. Please send mp3s ONLY. We will listen to everything that comes in but cannot give feedback on every demo we receive. However, if we are interested to release your stuff, we will be in touch! 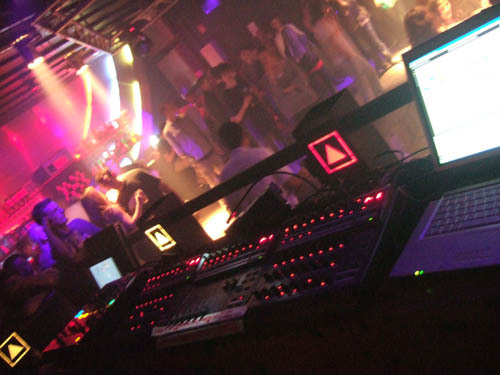 For live bookings: please let us know the date, location, venue size, proposed budget, & any other acts booked. 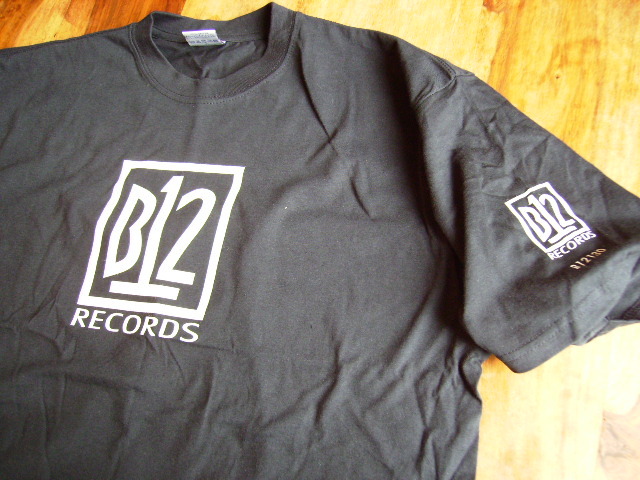 B12 are available for gigs up until November 2007, and then after January 2008. Mike Golding is also available for DJ'ing at any time.